"Grant Wood: American Gothic and Other Fables"
Grant Wood's reputation as an artist will be forever linked to one painting - - American Gothic, one of the most familiar images in American art. In “Grant Wood: American Gothic and Other Fables” the Whiteny Museum of American Art sought to show that there is more to Grant Wood than one painting. Wood was born in Iowa in rural Iowa in 1891. However, when he was 10, he moved to more urban Cedar Rapids after the death of his father. There he showed an early interest in art. After graduation, he traveled first to Minneapolis and then to Chicago to study art. In addition to painting, he also learned jewelry making and about decorative arts. When his mother became ill in 1916, he returned to Cedra Rapids. There he was able to put his artistic skills to work, doing commercial art for advertisements and commissions. As a result, he was able to make four journeys to Europe during the 1920s to visit museums and study the works of the European masters. At first, Wood was interested in the work of the Impressionists. However, during his trip in 1928, he was impressed by the works of some of the German and Flemish masters. Consequently, he changed style, incorporating more detail and harder edges in his work. He also came to believe that American artists had to break free of Europe. He felt Americans should paint subjects that reflected their own roots and society. Wood came to be the leading proponent of the Regionalist movement. For Wood, this meant depicting his native Iowa. One of his first paintings in this style was American Gothic. It was an immediate success when it was exhibited in 1930 and catapulted Wood to national and international fame. 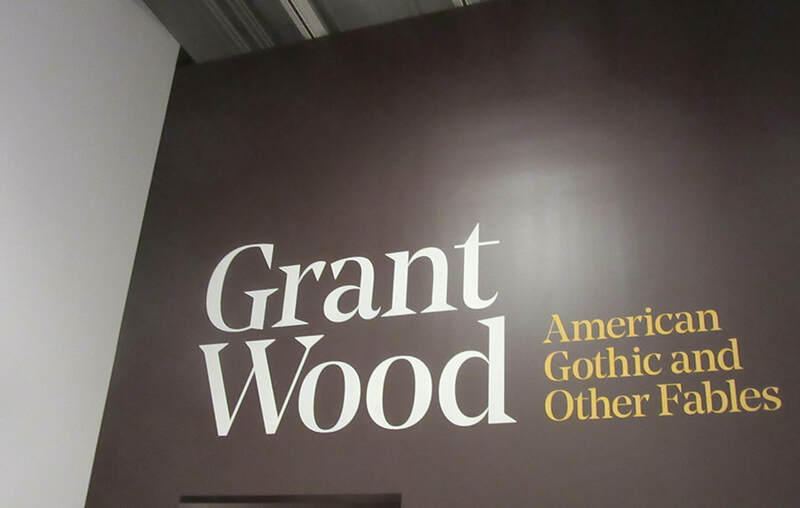 As the Whitney's exhibition illustrated, Wood continued to produce work after American Gothic. He did landscapes of rural Iowa, portraits of its inhabitants and work in the decorative arts. He died in 1942. Wood has became known for his depictions of rural life. His works are often said to celebrate traditional Midwestern values such as hard-work, self-reliance and values of community. But there is an unsettling theme running through his work. Often they seem to have an element of parody or satire. For example, in an early work the composition is like a Renaissance alter piece but the figures are adoring a model bungalow, which is being held aloft in admiration by a Madonna-like figure. Similarly, in the American Golfer, the composition is like that used for portraits of European nobles, yet the subject whose eyes are cast up to heaven, is a man in a business suit swinging a golf club. As storm clouds in Europe grew in the 1930s, Wood embarked on a series of genre paintings, which supposedly were to remind Americans of traditional values. The best known of these depicts the story of George Washington chopping down the cherry tree. However, the boy Washington is depicted with the mature head like that which appears on the dollar bill. Thus, rather than being an affirmation of traditional values, the painting can be seen as a parody of modern commercialism. American Gothic lends itself to parody and has been parodied thousands of times. Indeed, Gertrude Stein believed that the comical couple with the pitchfork were meant as parody. Wood always denied this. However, seeing this same sense of humor surfacing again and again in his works makes one think that Ms. Stein got it right. Above: American Gothic was on loan to the Whitney from the Art Institute of Chicago. Art review - Whitney Museum - "Grant Wood: American Gothic and Other Fables"